After the Rise of ISIS, Will Iraq’s Shiites Secede? The US Senate Votes to Partition Iraq. Softly. 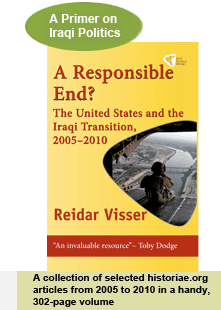 On 26 September 2007 the United States Senate voted 75–23 in favour of an amendment to the defence spending bill for 2008 that authorises the US government to “encourage” Iraqis to find a “federal” solution to the internal conflicts in their country… Full story here. Posted in Iraq and soft partition, US policy in Iraq: Leverage issues | Comments Off on The US Senate Votes to Partition Iraq. Softly. Soon after the recent announcement that Norway’s Egil “Drillo” Olsen is the new coach of Iraq’s successful national football team, critical voices emerged in the Norwegian media. Some suggested that Olsen would effectively be “collaborating with the US-led occupation of Iraq”, whereas others were concerned that he might be unable to navigate the ethno-sectarian tensions of the country when selecting players for future matches… Full story here. Is Statoil Getting It Wrong in Iraq? Recently announced plans by Statoil to open an office in Arbil, the capital of the Kurdistan federal region in Iraq, raise several critical questions about the company’s ability to gauge the fundamentals of Middle Eastern politics… Full story here. Posted in Iraqi constitutional issues, Oil in Iraq | Comments Off on Is Statoil Getting It Wrong in Iraq? For some time, analysts have been suggesting that the Bush administration’s “surge” strategy may have achieved a measure of success in certain parts of Iraq. Many highlight the tendency on the part of local tribes in the Sunni-dominated areas to stand up against al-Qaeda, in that way emphasizing their own “Iraqiness” as well as their unwillingness to join in an all-out war against Western civilization. The number of attacks against U.S. forces has declined in many of these areas, and there are signs that al-Qaeda has been forced to relocate to new areas and to choose new targets. However, perhaps the most convincing indicator of a degree of “surge” success is one that has gone largely unnoticed… Full story here. A steady stream of US commentators keep expressing support for the idea of some kind of ethnic partition, be it “soft” or “hard,” of Iraq. Despite the repeated warnings against division by military advisors and experts in humanitarian aid, the partition theme simply refuses to fade away from the American debate… Full story here. Perhaps the most important aspect of the recent British withdrawal from the urban centre of Basra to a base near the city’s airport is the reaction from local political forces. So far, the loudest response has come from the Sadrists, who publicly claim that their armed campaign led to the British withdrawal. The Sadrists claim is in fact a remarkable echo of events that took place as early as 2003. On Friday 6 June of that year, Sadrists demonstrated peacefully in the city of Basra. Their principal demand was as follows: the withdrawal of British forces from the population centres of Basra, and the concentration of all foreign forces “at locations on the outskirts of the city”. In the subsequent period, the Sadrist protests gradually grew more violent, and Basra soon became more dangerous for British troops. As early as 2004, British influence was in steep decline. In other words, the recent pullout itself was a largely symbolic affair: the British ceased exercising effective control of Basra a long time ago. Also Western commentators – particularly in the United States – have suggested that the Basra pullout represents “British defeat”. However, that judgment rather exaggerates the differences between “gangland Basra” and what is construed as the more “pacific” central parts of Iraq. The main difference between the US and the British approach does not relate to militia power as such, but rather to the extent to which there has been an attempt to manipulate the political games in which the militias take part. In the south, the British have largely maintained a neutral position, with a variety of armed factions coexisting in some kind of uneasy equilibrium, and with a diverse range of political forces gaining power: the Islamic Supreme Council of Iraq (ISCI, formerly SCIRI) in Samawa and Nasiriyya; the Sadrists in Amara; Fadila in Basra. In the rest of Iraq, US forces have largely allied themselves with Kurdish and ISCI parties and their militias (technically “integrated” in the security forces and the Iraqi army), and have supported these groups in their efforts to suppress internal dissent. Ideologically, this has been presented as an effort to build a “moderate” base; in practice it has involved giving consent to much highhandedness by local authorities. Thus, repression and militia rule are not absent from the US-controlled parts Iraq, but they take on a more orderly form than in the far south. In fact, in many ways it was the early US concessions to the ISCI-Kurdish militia axis that emboldened these parties to make maximalist demands on issues like Kirkuk and a single Shiite federal region and in turn created many of the subsequent complications in the process of national reconciliation in Iraq. Washington apparently had to do this because its own military strength in Iraq was deemed insufficient – something which British military authorities, for their part, were critical about early on. Over the coming months, both the position of the Sadrists and the further development of militia relations in Basra will be crucial. There is some indication that relations between Fadila (which remains in control of the governorate despite a vote of no confidence) and Sadrists have improved slightly during the summer. Muhammad al-Waili, Basra’s governor, has spoken out for the release of Sadrist prisoners held by the British. The Sadrists in the Iraqi parliament appear to have backed Waili in his confrontation with the Maliki government: it was the Sadrist chairman of the legal committee in Iraq’s parliament who signed a recent letter of protest against the government’s decision to remove Waili. On the other hand, ISCI has in the past been skilful in forestalling alliances between its two main competitors in Basra, and, moreover, could now benefit from the handover to Iraqi government forces. Westminster-centric analyses of the British withdrawal have pondered whether the timing was linked to the Labour Party’s upcoming annual conference. The more important question is who will be Basra’s governor three months from now. It would be a setback to the image of the Iraqi army as a “neutral player” if the first thing to happen after the British withdrawal were the ouster of Fadila and the fall of one of the last bastions of resistance to ISCI rule in the Shiite parts of Iraq.